The Isle of Thanet /ˈθænɪt/ lies at the most easterly point of Kent, England. While in the past it was separated from the mainland by the 600-metre-wide (2,000 ft) Wantsum Channel, it is no longer an island. Archaeological remains testify to the fact that ancient peoples lived here. Today, it is a tourist destination, but it also has a busy agricultural base. Standard reference works for English place-names (such as Eilert Ekwall's Concise Oxford Dictionary of English Place-Names) all state the name "Tanet" is known to be Brythonic in origin. Commonly the original meaning of Thanet is thought to be fire/bright island (tân means fire in Modern Welsh), and this has led to speculation the island was home to an ancient beacon or lighthouse. The Historia Brittonum, written in Wales in the 9th century, states that "Tanet" was the name used for the island by the legendary Anglo-Saxons Hengist and Horsa, while its name in Old Welsh was "Ruoi(c)hin"; this name may be translated as "gift" (rhwych in Modern Welsh). The 7th-century Archbishop Isidore of Seville recorded an apocryphal folk-etymology in which the island's name is fancifully connected with the Greek word for death (Thanatos/Θάνατος), stating that Thanet, "an island of the ocean separated from Britain by a narrow channel ... [was] called Tanatos from the death of serpents; for while it has none of its own, soil taken from it to any place whatsoever kills snakes there." Archaeological evidence shows that the area now known as the Isle of Thanet was one of the major areas of Stone Age settlement. A large hoard of Bronze Age implements has been found at Minster-in-Thanet; and several Iron Age settlements have also come to light. Like their predecessors, the Romans also crossed the sea to invade Britain. Julius Caesar came first, briefly, in both 55 and 54 BC. In 2017 archaeologists from the University of Leicester excavated a Roman fort covering up to 49 acres (20 ha) at Ebbsfleet, and dated it to around 55–50 BC. They further linked it to Caesar's invasion of Britain in 54 BC, and suggested that the invading force arrived in nearby Pegwell Bay. Nearly a century later, in 43 AD, Claudius sent four legions to Britain, where the Romans were to remain for the next 400 years. During that time the port of Richborough, on the opposite side of the Wantsum Channel, became one of the chief ports. After the breakup of the Roman Empire and their departure from Britain, other invaders soon followed. Then came three keels, driven into exile from Germany. In them were the brothers Horsa and Hengest ... Vortigern welcomed them, and handed over to them the island that in their language is called Thanet, in British Ruoihm. Throughout this time the Isle remained an island. The Wantsum Channel allowed ships to sail between the mainland and the island in calm waters. Gradually this silted up, and the last ship sailed through the Channel in 1672. In 597 Augustine of Canterbury is said, by Bede, to have landed with 40 men at Ebbsfleet, in the parish of Minster-in-Thanet, before founding Britain's second Christian monastery in Canterbury (the first was founded fifty years earlier by Columba on Eileach an Naoimh in the Hebrides): a cross marks the spot. Minster's village website states "It is widely believed, around 670 AD, whether in truth or legend, that the Hind emblem owes its origin to Egbert, King of Kent and Princess Domneva. The King purportedly asked Domneva which piece of land she wished to take as compensation for the murder of her two brothers. Her answer was that she would take no more than her tame deer would run around. This the King granted her with pleasure, and the land became the new Minster." Domneva is a variant name for Domne Eafe. Following the raids on the Isle of Sheppey, Thanet became a regular target for Viking attacks, its vulnerable coastal monasteries providing convenient targets for the invaders. By 851 and again in 854, the Vikings overwintered in Thanet and continued their raids in spring. Thanet's monasteries were subsequently used by the Danes as feasting halls or general headquarters. In 865, the Great Heathen Army encamped in Thanet and was promised by the people of Kent danegeld in exchange for peace. Regardless, the Vikings did not abide by this agreement and proceeded their rampage across eastern Kent. By 1334–1335 Thanet had the highest population density in Kent according to King Edward III's lay subsidy rolls. Margate is mentioned in 1349, in a dispute about the land of Westgate Manor. Thanet acted as a granary for Calais and documents towards the end of that century refer to turreted walls beneath the cliffs needing maintenance. Coastal erosion has long since destroyed these structures. Margate was incorporated as a municipal borough in 1857 and Ramsgate in 1884. Broadstairs and St Peter's Urban District and the Isle of Thanet Rural District covered the rest of the island from 1894 until 1974. By 1974, however, all these boroughs and districts had been abolished, and since that year the Isle of Thanet has formed the major part of the District of Thanet. The Isle of Thanet first came into being when sea levels rose after the last glacial period, around 5000 BC. The North Sea encroached on the land which is now the estuary of the River Thames, and southwards to reach the higher land of the North Downs, leaving behind an island composed of Upper Chalk in its wake. Eventually the sea broke through river valleys in the North Downs to the south (Middle Chalk) and finally today's English Channel was opened up. The Upper Chalk is a soft pure-white limestone with abundant flints. (The Isle gives its name to the Thanetian age of the Paleocene). The proto-River Stour then formed part of the intervening water, with a new tributary, the River Wantsum, completing it; it became known as the Wantsum Channel. The Wantsum Channel gradually narrowed as pebble beaches built up at the southern end of the strait, blocking silt coming down the Stour. Bede, in the 8th century, said that the Channel was then three furlongs wide (660 yards (600 m)). 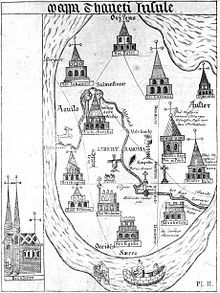 A map of 1414 showed a ferry crossing at Sarre. The first bridge over the channel was built there in 1485. Until the mid 18th century there was a ferry between Sandwich and the island; in 1755 a wooden drawbridge was built, and the ferry was closed. Today the Isle is an island no longer and the erstwhile channel is now flat marshland criss-crossed by drainage ditches. Meanwhile, the exposed chalk cliffs are gradually being worn down by the sea, particularly at the North Foreland. Much else of the coast is a built-up area. The Wantsum area is still liable to flooding: during the North Sea flood of 1953 Thanet was cut off for a few days, but the sea defences have been strengthened since then. The soil and equable climate of the Isle have always encouraged arable farming. ... a garden indeed, a county of corn but the labourers' houses all along, beggarly in the extreme. The people dirty, poor-looking, but particularly dirty. Today there are still farms inland, but the coast is nearly all covered in settlements, most of which have come into being in the 19th and 20th centuries. The principal landmarks on the Isle are the North Foreland, and all the bays around the coastline, the principal ones of which are Minnis Bay, Palm Bay, Botany Bay, Joss Bay, and Pegwell Bay: the latter being part of the estuary of the River Stour. In 2007, seven of those beaches met stringent quality standards and were awarded as Blue Flag beaches: Minnis Bay, Botany Bay (Broadstairs), Margate Main Sands, St Mildreds Bay (Westgate), Stone Bay (Broadstairs), West Bay (Westgate), and Westbrook Bay. In 2008, this had risen to 10 beaches. The rail connections are via the Chatham Main Line through Margate to Ramsgate, and the Ashford to Ramsgate (via Canterbury West) Line. A high-speed rail link from London to Thanet began in December 2009, and forms part of the UK's first true high-speed commuter service, according to the South Eastern Railway Company. Main road links are the A28, which brings traffic from Canterbury and Ashford; and the A299, north coast route. The Thanet Coastal Path skirts the coast. There is an airport at Manston, formerly RAF Manston, but since renamed by its commercial operators as Manston Airport. The airport is no longer in operation. Ferry services (predominantly freight and car with passengers) were operated by Transeuropa Ferries to Continental Europe from the Port of Ramsgate but ceased in 2013. A tramway was once operated by the Isle of Thanet Electric Tramways and Lighting Company from Westbrook to Ramsgate from 1901 to 1937. The tramway had a narrow gauge of 3ft 6 inches. The Isle of Thanet is mentioned in the 1977 Ian Dury song "Billericay Dickie": "I'd rendezvous with Janet, quite near the Isle of Thanet, she looked more like a gannet, she wasn't half a prannet". It is also mentioned in the 2002 song "She's in Broadstairs" by Half Man Half Biscuit on their album Cammell Laird Social Club: "I'm on another planet, She's on the Isle of Thanet". ^ "Saved haven A self guided walk in Sandwich, Kent" (PDF). Open Sandwich. The Royal Geographical Society with the Institute of British Geographers. 2013. p. 11. Archived from the original (PDF) on 6 October 2014. Retrieved 3 October 2014. ^ Ekwall 1960, p. 464; Glover 1976, p. 189; Mills 1998, p. 342. ^ Isidore of Seville, quoted in Vennemann 2012, pp. 392–3. 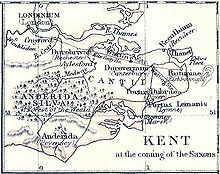 ^ "First evidence of Julius Caesar's invasion of Britain discovered in Kent". The Independent. 28 November 2017. Retrieved 29 November 2017. ^ "First evidence for Julius Caesar's invasion of Britain discovered — University of Leicester". www2.le.ac.uk. Retrieved 29 November 2017. ^ "Coast Protection at Reculver - Historical Background". Canterbury City Council. Archived from the original on 27 May 2012. Retrieved 23 September 2012. ^ "Notes on Ramsgate:Historic Kent". Archived from the original on 29 September 2008. Retrieved 29 September 2008. ^ Rollason, David W. (1982). The Mildrith legend: a study in early medieval hagiography in England. Leicester University Press. pp. 10–1. ^ Forte, Angelo; Oram, Richard D.; Pedersen, Frederik (2005). Viking Empires. Cambridge University Press. ISBN 978-0-521-82992-2. ^ "The Rural Landscape of Kent", SG McRae and CP Burnham, Wye College, 1973. ^ "The town and port of Sandwich". British History Online. Retrieved 25 September 2012. ^ "BlueFlag.org". Archived from the original on 16 February 2012. Retrieved 29 August 2018. ^ "TransEuropa Ferries". Retrieved 29 June 2007. ^ "Ian Dury & The Blockheads - Billericay Dickie Lyrics". Songlyrics.com. Retrieved 29 July 2014. ^ "She's In Broadstairs". The Half Man Half Biscuit Lyrics Project. Retrieved 1 May 2015. This page was last edited on 9 February 2019, at 20:57 (UTC).